St. Patrick’s Day Weekend, Imagination in Space and FAME by Alex Mitow are teaming up with six NYC chefs for the first-ever Broth Fest. Why broth? Because the whole country is talking about broth: Is it a magical elixir? The new Gatorade? Or is it a new, nourishing winter menu item drawing on very old traditions. We’re not sure, but we know Kobe Bryant swears by it. And, we know it’s delicious. 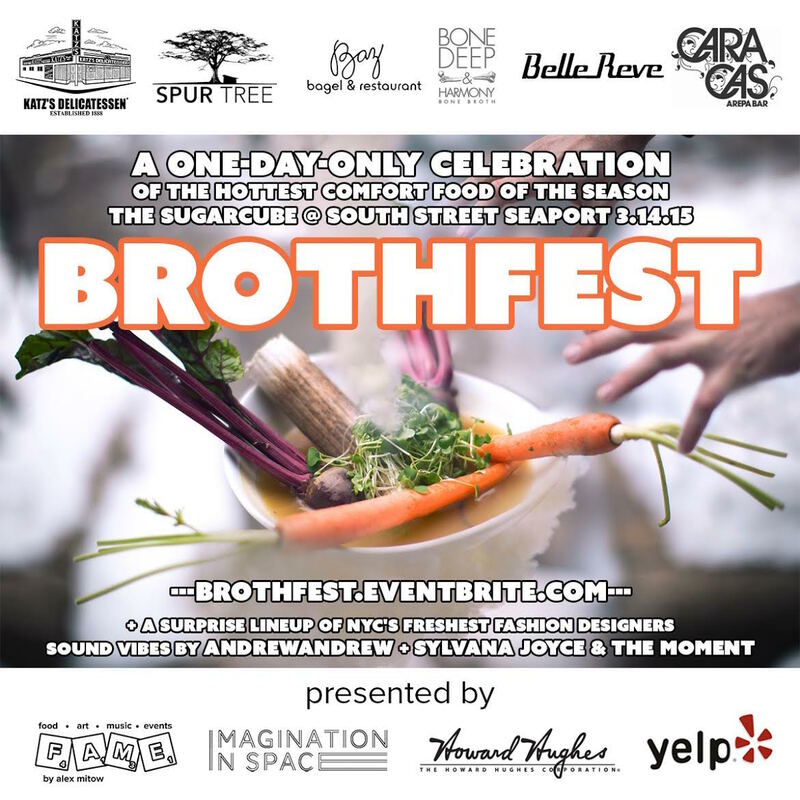 Instead of just speculating, we thought: Why not create a pop up fest around broth so everyone can decide for themselves? March 14 at the inflatable Sugarcube in South Street Seaport, Katz’s Deli, Belle Reve, Baz Bagel + Restaurant, Caracas Arepa Bar, Spur Tree, FAME and Bone Deep and Harmony are preparing original takes on bone broth. Each restaurant will pull from their culinary tradition to create a unique broth with outrageous garnish for New Yorkers. We’ll also have live music, DJs and surprise appearances from NYC fashion designers. Tickets are $33 for 90-minute sessions. This entry was posted by Rosemarie on Sunday, March 8th, 2015 at 6:08 pm	and is filed under American/Comfort, Events, Financial District, Manhattan. You can follow any responses to this entry through the RSS 2.0 feed. You can leave a response, or trackback from your own site.